Impingement and Instability. 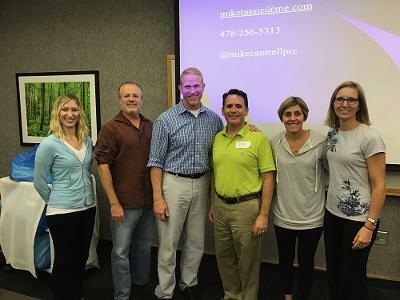 Had a great weekend at Bon Secours in Richmond Virginia exploring the frontal plane implications of foot and ankle function, knee function, hip and pelvic function, thoracic and shoulder function and cervical function. Appreciating what the frontal plane ankle does for the frontal plane hip and vice versa was a big part of our morning on the first day. We learned about neurological reference centers and then applied the patterned differences between the right and left side to the gait cycle. 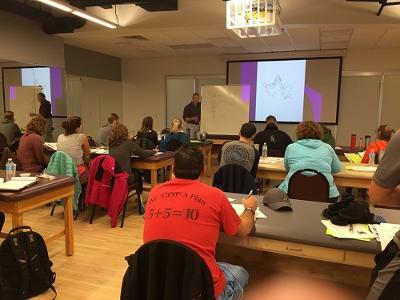 During the second half of the first day, we discussed the knee joint and worked on how to correctly diagnose and treat both compensation and orientation issues between the femur and the tibia and vice versa. The frontal plane influence up to the diaphragm as a basis to the transverse plane performance above the sacral base was a big part of our morning on the second day. This gave us added insight to treating instabilities that could be experienced at the hips, ischial seat or impingement issues commonly seen across the hips. That left the afternoon of day two to talk about the thorax and scapula, with a special emphasis on the scapular-thoracic instabilities that can develop on top of the thoraco-scapular patterns commonly seen. Manual techniques to treat Sibson's fascia, the right intercostal wall and the left pec major were also shown and discussed in great detail. 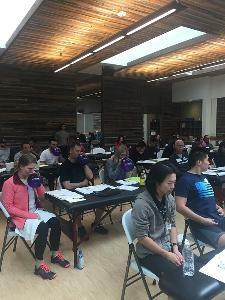 It was fun to practice techniques together and to provide properly referenced cuing for our patients during exercise to help us all become better at delivering PRI. California Dreamin' was a common response to Water Sports and Physical Therapy hosting another Postural Respiration at their facility integrated with Exos of La Jolla. This was another great mix of professions including PT's, ATC's and strength and conditioning professionals. There were four chiropractors who have attended other courses, an RN and a dentist from San Diego who specializes in TMD and facial pain. He wanted to understand the relationship of the diaphragm and orientation of the neck and head as it relates to the TMJ! This is such a great venue and we hope to keep coming back. Yours truly was grateful to be a local and drive 15 minutes to the location! Attendees came from as far as Virginia, Texas and Colorado! Over half of the class was new to PRI! Many thanks to Matt Uohara and Matt Varca for assisting. They make the weekend a rewarding experience for students and faculty! PRI Integration for the Home. Seattle Washington. Jill Moynahan and the team at Providence Homecare in Renton Washington were fantastic hosts for a great weekend with a super group of people in a very beautiful place. Thank you for your kind hospitality and the opportunity to enjoy such a fun weekend together. The class enjoyed going over the new and improved PRI Integration for the Home material, including the new ADL exercises and the standing resisted squat progressions. A couple of attendees who had taken the course prior to the new updates said it was totally worth attending again, simply because they were able to learn about and practice these new techniques. And if you haven't had the opportunity, Seattle Washington is a beautiful and super fun place to visit. 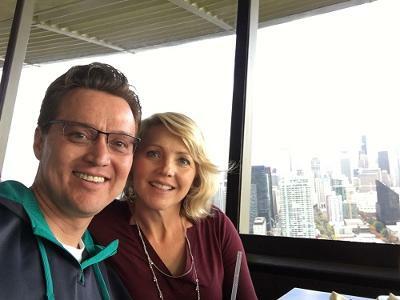 My wife Karen was able to make the trip with me and we enjoyed going to great places like the Seattle Art Museum, the Pike Street Market, the Space Needle, Lake Washington and the Columbia Tower. The view of Puget Sound and the City of Seattle from the rotating restaurant at the top of the Space Needle really gave us an appreciation of the majestic beauty the great Northwest has to offer. Thank you Seattle for your ongoing interest in PRI and our opportunity to visit your beautiful city. 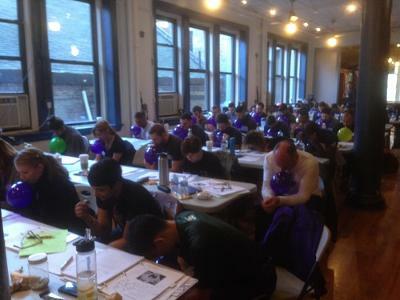 How appropriate to teach Pelvis Restoration at Finish Line in New York City weeks before the New York City Marathon. Tri-planar pelvis control is vital not only for runners, but for any individual that sits, stands, or walks in life. In that case, ALL humans. We all need a stabile pelvis in order for our hips and trunk to rotate and our ankles and necks to wobble. Danny, Ashleigh, and Kim thanks for your first row enthusiasm. Rondel, Stone, Otis, and Jason I appreciated your hunger and thoroughness to learn and understand PRI. The first time PRI course attendees (Matt, Jake, Alan, Karin, Kara, Oleg, Lily, Jeremy, Matt, Jimmy, Carly, Ross, Iwalani, Dan, Elana, Erica, Jeff, Emmi and Jameela) my respect and admiration for going on thru this in-depth material with me. Those attendees for coming back for more PRI, your passion to learn and apply principles taught in this course you have my professional respect. FINISH LINE P.T.—Caroline, Lily, Alison, Jason, Carly, Alicia, Andrew, Michael, Raechel, and Emmi, thank you for hosting all of us. Your tireless commitment to PRI is awesome! Lastly, a huge shout out to my awesome assistants Trevor and Greg, PRC’s from Resilient Performance Physical Therapy you have wicked PRI skills. I loved teaching in New York and had a wonderful time exploring the area after the course. Thank you! I spent a great weekend at the Fortius Sport and Health complex in beautiful Vancouver British Columbia. What an awesome host site. And what a super group of professionals attending, most of whom were attending their first ever live PRI course. Ryan, you were a great host and all the attendees were great, especially considering that we were holding the course on the weekend of Thanksgiving in Canada (and the Toronto Blue Jays were back in the playoffs!). Thanks for spending time with us and missing or rescheduling your Thanksgiving turkey dinners. As for the majestic beauty of Vancouver, this is God's Country. Wow! Reminded me of my youth growing up near beautiful Glacier National Park in NW Montana. And when I went on a walk around the lake across from the complex and saw a "Caution, Bears in the Area" sign, I felt right at home. Fortunately, I didn't run into any bears or other wild animals. But it was beautiful. As for the Myokinematic Restoration course, this weekend was a nostalgic experience for me. One, because my PRI journey started with this course and it has been my pleasure to have taught it so many times over the years to so many new and energetic attendees, both live and through the home study. Two, because I realized I will not be teaching this course as much in the future because of my expanding affiliate course responsibilities and because we have a growing number of new faculty members who will have the responsibility of teaching our primary courses. 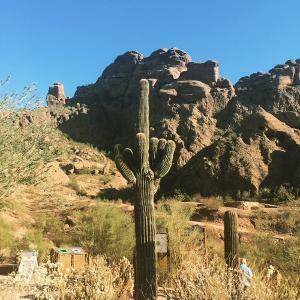 I'm excited for our institute's growth and development, but I must say, a reflective weekend like this in such a beautiful place really made me miss those early years of PRI and all those great experiences. A big "thank you" to anyone who has ever shared a Myokin moment with me over the years. You are what makes it all worth it! When a patient has an active R TMCC pattern that needs occlusal management, a lower MOOO style bite splint is my go-to intervention. But not all malocclusions are created equal, and the question comes up frequently on how to manage a bite with various degrees of malposition and alternate occlusal schemes. I have attached a resource on how I manage missing teeth, transposed teeth, cross bites and open bites; and the thinking that goes into why I choose to deviate from the standard design process with various malocclusions. Summit Orthopedics has a palatial sports complex. 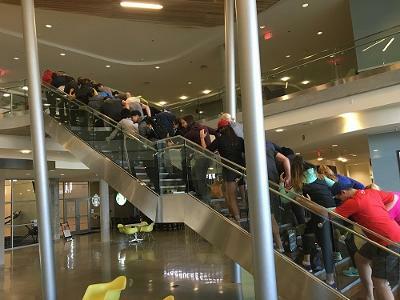 They hosted Impingement and Instability and we dove into an explanation of the reasons why humans choose to impinge and hurt. Yes...choose! Neurological reference centers were the main topic of conversation and how understanding these "RC's" can help a practitioner eliminate symptoms in minutes. Additionally we learned about precisely why tennis elbow is so problematic and how to manage it with rotator cuff management. Don't miss this incredible class when you begin the journey into the second tier of PRI courses. It was a joy to once again travel to St Lukes. This time however it was different. 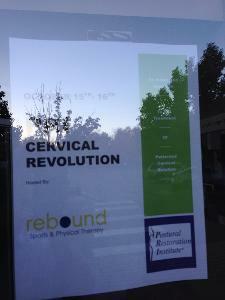 The class was Cervical Revolution and the attendees were on hand to learn about the amazing "super computer" called the cervical spine and cranium. We went over, in detail how the mandible and the neck are related, how the neck is the controlling factor for cranial strains. This led us to the reasons why individuals have neck pain and headaches. Finally we got into integration with the dental profession, splint discussions and detailed management with dentists. Now we have a better idea WHEN to call the dentist! If you have had any thoughts about attending this amazing class I would encourage you to do it as soon as you can! Especially if you are a dentist!